Like the Controls collection in a Win or WebForms, WPF controls have an ownership hierarchy. A Window may own a GroupBox, and that GroupBox may own a CheckBox, and so on. Suppose you were to lay out this interface using the visual designer. The XAML looks like Listing 6-11. <Button Height="23" Margin="101,0,102,12" Name="cmdGetData" VerticalAlignment="Bottom"
And the window looks like Figure 6-12. Note the hierarchy in the XAML. 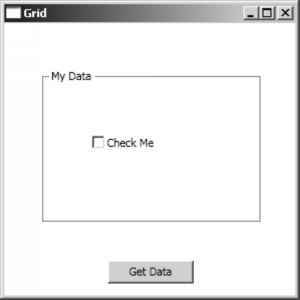 The Window contains a Grid that contains a GroupBox that contains another Grid that contains a CheckBox. To iterate through this hierarchy, you need to resort to recursion. You must bear in mind a few considerations about recursing through a WPF control tree. As noted in the previous section, the owner Window doesn't have a Controls collection. Rather, it has a Content property. This property is of type object, and it must be cast to a specific container control object in order to access its Children property. You can accomplish this using the method shown in Listing 6-12. After the type of the child container has been determined, you can iterate through its component elements. If one of these elements is an owner to many controls—say, like a GroupBox—then you can cast its Content property to the appropriate container object and continue the recursion. When you draw a GroupBox on a Window, for example, it automatically displays with a Grid container inside it. Because a GroupBox is intended to hold multiple controls, you therefore need a container like a Grid to handle the content. Thus, to iterate through a series of nested controls on a Window, you can use the recursive IterateControls() method shown in Listing 6-13. This method iterates through the elements in a UIElementCollection object. After the object type is determined, you can use the appropriate property to extract its value. If the object type is a container, the property that references it UIElementCollection object is passed to IterateControls(), and the recursion continues.